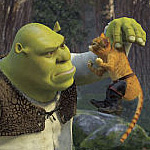 Defying the odds, Shrek, Fiona and Donkey return to the big screen in a winning sequel to the modern-day classic Shrek. Picking up where the first installment left off, Shrek (Mike Myers, the Austin Powers trilogy) and Fiona (Cameron Diaz, Charlie’s Angels) are happily married and enjoy a beachside honeymoon. Ready to settle into a domesticated life on Shrek’s swampland, the couple return home to find Donkey (Eddie Murphy, The Nutty Professor) waiting for them. Donkey’s on the outs with his dragon lady and in dire need of attention. Right on Donkey’s tail, though, is even more disturbing news for Shrek. A royal request to visit the in-laws becomes the first disruption to Shrek and Fiona’s matrimonial bliss. Taking the hen-pecked highroad, Shrek packs his bags and the trio take a very long, long ride to the kingdom of Far, Far Away. The kingdom is a Hollywood Babylon of fairy tale stars, home to big names like Cinderella and the location for galas featuring celebrities like Tom Thumb and Thumbelina. Unfortunately, Shrek and Fiona form a small ogre minority of two in the affluent kingdom. Fiona bears the extra weight of being a letdown to the parental units. She was, after all, supposed to grow up to kiss Prince Charming (Rupert Everett, My Best Friend’s Wedding), which would cure her of her ogre curse. In addition to Fiona’s parents (John Cleese, Monty Python and the Holy Grail, and Julie Andrews, The Princess Diaries), the newlyweds must contend with the nefarious marriage-busting antics of the Fairy Godmother (Jennifer Saunders, Absolutely Fabulous), who also happens to be the stuck-up Prince Charming’s mom. Shrek 2 manages to build on the all-ages appeal of the first movie with a whiz-bang sense of humor smart enough for adults to enjoy while also being outlandish enough to entertain the kids. The ogre and his friends lampoon not only fractured fairy tales of yore, but also Hollywood and commercial franchises like The Gap and Azar’s Big Boy. While many sequels wind up being mere remakes of the original, the writers of Shrek 2 wisely forge into new territory with some new characters. Joe Stillman, returning from Shrek, has this time teamed up with J. David Stem and David N. Weiss, who co-wrote Jimmy Neutron: Boy Genius, to create a witty satire with plenty of humor that will be lost on the kids but much to the amusement of their parents. Heading up the new recruits is Puss-in-Boots (Antonio Banderas, the Spy Kids trilogy), a hilarious addition to the mix whose feisty, claws-out aggressiveness can at the drop of his feathered hat turn into the meekness of a fragile, doe-eyed kitten. In an inspired sequence that lampoons reality TV, Shrek, Donkey and Puss are arrested in a wildly inventive tour-de-force involving catnip and ground pepper spray. Equally whimsical is their big jail break, commandeered by the Ginger Bread Man, Pinnochio, and the Three Blind Mice. In such scenes, the movie’s jovial irreverence is reminiscent of Airplane! and it’s almost forgotten that this is, ultimately, supposed to be a children’s movie. The animators have also taken the world of Shrek to the next level, with some stunningly lifelike scenery and, in some scenes, they have effectively recreated the fuzzy look of Super 8 home movies and the manic views of hand-held TV cameras. Even so, the humans are still far more stiff than their colorful co-stars; that’s rather puzzling considering just how lifelike Shrek and Donkey can be. But that’s a small complaint for a movie that has so much goodwill to offer. To that end, the clever story line manages to reinforce Shrek’s message of tolerance and individuality. Shrek 2 is hardly a heavy-handed film, though, and cameos by none other than a blues-singing Captain Hook, the Headless Horseman, and Joan Rivers, help keep the jokes flying. It’s only appropriate that Shrek 2 takes many jabs at Hollywood. For a community that’s so quick to spin a buck on mindless dreck and their sequels, Shrek 2 proves to be a worthwhile sequel that can stand on its own.